In our everyday life we primarily make use of language in face-to-face interactions with others. Trivial as this statement may seem, the precise ways in which this affects our conceptualization of experience as well as the language system and the way it is used are far from clear. This book examines the issue, and concentrates on the intersection of language, interaction, and cognition. The focus is on a phenomenon – never before studied as such – which I call fictive interaction (FI). This constitutes the use of the schematic interactional structure of ordinary communication as an organizing frame to understand, think, and talk about verbal as well as non-verbal entities, processes, and relationships. Different levels of human communication are explored, from the overall situation of interaction to the discourse and the discourse content, down to the levels of the individual sentence, the clause, the phrase, and the lexical item. Empirically, this work is mainly based on ethnography in Spanish and American criminal courts, with special attention to murder trials in domestic violence cases. The theoretical framework followed is the cognitive linguistics theory of conceptual blending (Fauconnier & Turner), enriched with Hutchins’s concept of distributed cognition, which adds a socio-cultural dimension to the network. 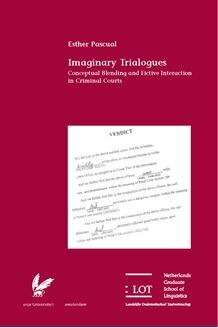 This study should be of interest to anyone interested in pragmatics, communication, courtroom interaction, and the conceptual structure and linguistic expression of fictive realities. More generally, it should interest anyone concerned with the interrelations between language structure and use, social interaction, and cognition within a given socio-cultural context.